Minion is one of those game-warping cards, whose presence greatly changes the strategic landscape. Though not necessarily a must-buy, its availability forces players to either buy it or give serious thought to how to respond to it. Minion’s primary strength comes from its glorious self-synergy. Like Caravan/Laboratory/Nobles, Minion is a card whose best complement is itself. But Minion one-ups those cards: handsize increasers need to pause every so often to pick up Treasures, but Minion is its own source of cash. When full-on into Minion mode, you should not need to stop buying Minions to get pesky Treasures like Gold that you’ll just end up discarding anyway. Minion works very well with cheap non-terminal actions: e.g., Pawn, Conspirator, Fishing Village. Pawn is especially valuable to the Minion player because it allows a +Buy, something often missing from many high-money engines. The key is to avoid buying cards that will likely be discarded to the Minion anyway: this rules out Treasure as well as most terminal Actions. One—or at most two—is acceptable if it’s an important terminal Action, like Mountebank or Goons. (Or a Remodel/Expand, since you’ll probably need one to get rid of your initial Chapel/other trashing card.) Any more and it’s just a waste, even with +Actions. Minion’s attack is also a good thing. Sometimes it benefits your opponents, but on average, you’d always prefer your opponents to have 4 cards than 5. The exception is Library/Watchtower, and of course, other Minion decks, which respond to Minion quite well. Minion is much less effective when you can’t get rid of non-Minion cards. Without good trashing options, it’s much harder to hit that critical mass of 25% Minion density in your deck. Accordingly, the best way to counter Minions (other than your own Minions) is to load them down with Curses. Swindler is a good choice too, since you are likely to hit a Minion, which are conveniently priced to be Swindled into Duchies (or even better, Dukes). As part of a hybrid strategy, Minion can work pretty well with Tactician and Library because of its ability to provide “invisible money”. And its discard/attack power is a good defensive response to Goons/Militia and other Minions. Minion doesn’t play well with most combos, however. This is because your hand is so often going to be cut in size that you can’t afford the luxury of chaining together complex Action chains without buying them en masse, which of course, defeats the whole purpose of going Minions. Minion players commonly face dilemmas early in the game. Should I discard my hand, drawing 4 and possibly missing out on $5 to get another all-important Minion? Or should I forsake the attack against my opponents? The answer is probably dependent on what kind of deck; if you and your opponents have been Chapeling into a thin, high-density deck, then your discard is likely to both hurt your opponents significantly as well as getting you to $5. Special note regarding Throne Room and King’s Court: if you Throne Room a Minion, planning to both take $2 and discard, you should always discard first. This is because if you discard and draw 4 terrible cards, you have a choice of discarding or taking $2. Taking the $2 first prevents you from being able to make this decision. On a side note: as powerful as this card is, I can’t get over its non-thematicness. What do Minions have to do with discarding and drawing? Wouldn’t your Goons and Militia be considered your Minions already? Even the picture doesn’t make any sense. This entry was posted in Intrigue and tagged minion. Bookmark the permalink. Minion, for me, is one of those cards like Fishing Village that I almost always base my deck around when it’s on the board except in extreme circumstances. I agree with most of what you wrote, but I don’t think that curse-giving attacks are much of an issue. With Torturer, you can just make sure to keep a Minion and get a new hand. With Witch and Familiar, it takes a good 15 turns to give away all of the curses, by which time a minion deck should have enough minions to draw it in almost every hand. Got a hand with some curses in it? Toss it away for four more cards. I’d dare say that Minion is better for curses than most + card cards because you cycle through the deck faster. Here is a game where I go Familiars before Minion, and my opponent goes Minion first (he buys 2 Minions before I have any Minions), and he loses big. In the “Works with” section, we clearly miss festival (once minion pile is depleted) ! Yes, Festival is probably the best support. Cellar/Warehouse are very good too, if you can’t trash. Cause handsize isn’t an issue. By the way: Minion’s strength depends a lot on the number of players, because Minion’s best friend is Minion as you wrote. I have had great success in overcoming some of the obstacles he mentions above in using terminal action cards by pairing up my hand with nobles and minions. The plus actions from the nobles, or the plus three cards depending on how many nobles I have previously played, allow me to use other action cards I normally would just discard and bring more minions into my hand to pair up with minions that I had hopefully drawn before. I agree with the person who said secret chambers. If there’s a minion game with a +2 actions card and some extra buys like worker’s village or festival, you can secret chamber away all your victory cards and the money cards that may still be hanging around in your deck before you grab a new hand. Ah just realized nobody else said secret chambers. Well, I say they work with them. Do you think it’s that Secret Chambers work that great with the Minion? Secret Chamber for it’s reaction effect can work pretty well against the Minion, letting you stash away your good cards for your new 4 card hand, an dumping the weak cards in the discard. But Secret Chamber is a terminal. It requires requires a +Action to use the Secret Chamber and not break your Minion chain, and in the best case the Secret Chamber itself that is going to produce at most $2 in a continued Minion chain, and even less if you actually draw it with a pair of Minions, or other while action card. Every Secret Chamber in your deck is one card that makes your Minion chain slightly less likely to pull itself together. In some sense, it’s kind of unwanted deck bloat. I could see myself buying one or two Secret Chambers early game on a $2 or possibly $3 turn to counter my opponents Minions, but loading up on them would be really counter productive, in my opinion. 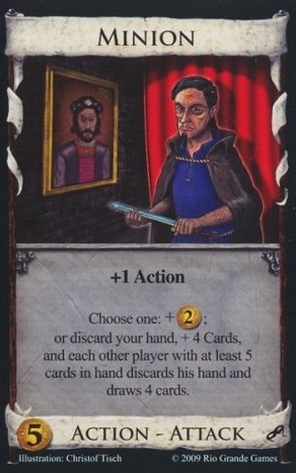 rrenaud– I know that it doesn’t make sense to bloat secret chambers, but I think that in a game with minions and +action cards, if you happen to grab one or two it’s nice to be able to discard everything for money before you grab a new hand. Also the reaction helps you get more minions into each hand if your opponents are also playing the same strategy, so in that sense I think they work well enough to want to get a couple, obviously you never want to load up on terminals. The Minion makes all the thematic sense in the world. Minions, by definition, do what their master tells them to; the choice of +2 money or attack lets you instruct your minion to your bidding. The picture of the minion’s master in the background is great, enforcing this idea of relentless servitude. Goons are necessarily hired thugs (making them a great fit for prosperity) while the word “minion” doesn’t really imply a specific motive for their service. btw: The pawn is “Handlanger” in the german edition. I don’t know what’s the best re-translation: dogsbody, handyman, gofer?! “Dogsbody” isn’t really a word in US English AFAIK, or at least I’m not familiar with it. “Handyman” is a false cognate; it sounds like someone who is “handy” to have around, but it really just means someone who’s good at fixing things that break in homes and small offices. “Gofer” is the closest; “point man” is also workable (from a basketball analogy widely used in the US), but both of these words imply a certain level of organizational skill that sets one individual apart from others, while “pawn” implies one person in a large organization whose leader considers them all interchangeable and expendable. Dogsbody is a perfect word for this in English-English. It means someone who will perform any task which is required, generally menial/tedious. Moreover, it seems very thematic to me if you have to play a Minion and discard your hand as your first action. You left your minion to handle this turn (while you went off to war against the other players, I suppose, if we stretch the analogy). Naturally he’s not as effective a leader as you, so he only gets a four-card hand. When you stay in command, he’s just another lackey, worth about as much to you as a steward or woodcutter. Minions are fine with plus actions and terminal actions. You just need the right ratios. If you can get some villages (any kind) you can minion until you reach one of them, play a terminal action once you get to it, etc. The terminal action you choose need to be worth the added size of your deck, but minions do not need to be the only card at the center of your deck. Hey, you trying to steal my name? Lol. I agree with you though. I guess you should mention that the teminal action probably shouldn’t be +cards only since the only thing that accomplishes is *maybe* getting another minion, whereas a terminal action that actually does something to either hinder the opponent or give you +$ or +buys is more beneficial. Once the Minions were gone, the Cities followed in fairly short order. The game ended with my having captured 7 of the 8 Provinces, with the three empty piles being City, Minion and Peddler. 3-pile ending AND 7/8 Provinces as the first player on your 13th turn. These are the moments we remember, right? Saw an interesting new twist on Minion combos last night – +Actions and Black Market. The BM’s not only are their own “invisible money,” they let you play out the coins in your hand before you ditch your hand to the next Minion. Minion is especially good against Ghost Ship. If your opponent plays the Ghost Ship against you, you keep one Minion and two junk cards in your hand, and you put your two best cards (apart from the minion) on top of your deck. Then when it’s your turn, you use the Minion to discard the two junk cards, and draw four cards. You will have your two best cards plus another two cards. Your opponent’s Ghost Ship will often help you to get a better hand. Ideally, yes, none. Treasures aren’t doing anything for you: they are often being discarded to your Minions, and they get in the way of you drawing more Minions. In general in a Minion deck the Minions are the key, and you want them to be as high a proportion of your deck as possible. Cards like Market are better than Treasure because they won’t stop you from drawing a Minion; they replace themselves and don’t cost Actions. Well, my son and I set up a random game and there was minion and great hall. Wow do they work great together. He emptied one pile following his strategy, while I swiped up all the Great Halls and minions. Three piles gone, and me on top due to Great Halls. I finally beat my son, but I feel like a cheating bad dad since I got the idea from here. But I’ll get over that. Here is an example game of what NOT to do against Minion. Unrated opponent. 15 Gold < 10 Minion. Today I played Minion with Grand Market. Very nice combo! I bought about 2 Colonies a turn. I used a single Steward to clean my deck and start the combo. Do you play the 4 cards immediately when you play Minion and choose the second option– discard + 4 cards? Or are those 4 cards added to your next turn? You discard all other cards in your hand and draw 4 new cards from your deck immediately, and continue your turn. All opponents who have 5 or more cards in their hand do the same. What if you only have a Minion left in your hand? (played all other Cards or needed to discard twice 2 Cards with a torturer). You Play the minion and get 4 new Cards?